The average body mass for an adult golden lion tamarin is about 600 grams (Ford and Davis, 1992). The name lion comes from the golden mane surrounding the head (Ford and Davis, 1992). This species has long digits used in the forging small insects and vertebrates (Garber, 1992). This species has nonopposable thumbs and the nails of the digits are claw-like. 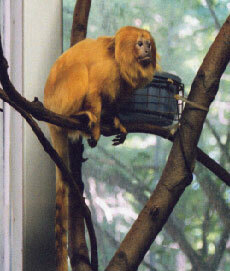 The golden lion tamarin is found in the country of Brazil, and is found on the Atlantic coast in the East. This species is found in the coastal lowlands, below 300 meters (Rylands, 1993). The golden lion tamarin is frugivorous, feeding on soft, sweet fruits, but will also eat flowers, nectar, insects, and small invertebrates (Kleiman et al., 1988). The golden lion tamarin has also been known to gnaw into bark for gum (exudates) like Callithrix species (Peres, 1989). This species is arboreal and diurnal. 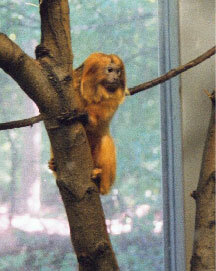 The golden lion tamarin has an average group size of around 5.8 individuals (Dietz and Kleiman, 1986). This species sleeps in tree holes during the night, and the dependence on tree holes might be an ecological constraint for the golden lion tamarin (Rylands, 1993). Both males and females disperse in this species (Baker, 1987). 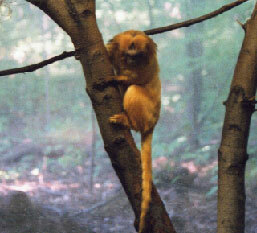 The golden lion tamarin moves quadrupedally through the main canopy of the forest (Fleagle, 1988). 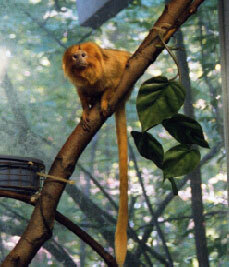 When climbing down tree trunks, the golden lion tamarin will either be in head down or tail down posture (Kleiman et al., 1988). Primarily the golden lion tamarin has a monogamous mating system, but polygyny and polyandry has also been seen in the wild (Rylands, 1993). Polgyny may occur in populations where there is overcrowding and a low chance of dispersal (Dietz and Baker, 1991). Polyandry may come about when there are more than one adult male in a group and a need to defend the reproductive female, or the female may want to increase the number of male helpers by confusing paternity (Rylands, 1989). In this species social suppression of ovulation does not occur, which is unusual amongst the callitrichids (Kuderling et al., 1992). Food sharing is more important in this genera than other callitrichids, and is important in maintaining the social structure (Brown and Mack, 1978). long call: The function of this call of the golden lion tamarin is to maintain pair bonds and to signify a group’s presence in their territory (Kinzey, 1997). Kleiman (1978) noted that female golden lion tamarins in estrus tend to decrease scent-marking suggesting that the female might not want to advertise that she is in estrus to males which are not her mate. suprapubic marking: This is when an individual presses the suprapubic pad against a substrate and deposits secretions by pulling itself along or by pushing itself with its feet (Epple et al., 1993). sternal marking: This is when a golden lion tamarin rubs the sternal gland against a substrate (Epple and Lorenz, 1967). 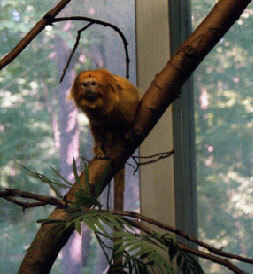 This is the most frequent scent-marking behavior for the golden lion tamarin (Epple and Lorenz, 1967). piloerection: This is where the hair of the golden lion tamarin stands on end and functions as an aggressive signal (Kinzey, 1997). The golden lion tamarin most often gives birth to twins, with triplets and quadruplets having been reported (Kinzey, 1997). Brown, K. and Mack, D.S. 1978. Food Sharing Among Captive Leontopithecus rosalia. Folia Primatologica. Vol.29, 268-290. Dietz, J.M. and Baker, A.J. 1991. O Modelo Limiar de Poliginia e Sucesso Reprodutivo em Leontopithecus rosalia (Primates: Callitrichidae). Paper presented at the XVIII Congresso Brasileiro de Zoologia, Universidade Federal da Bahia, Salvador, 26 February to 1st March 1991. Dietz, J.M. and Kleiman, D.G. 1986. Reproductive Parameters in Groups of Free-living Golden Lion Tamarins. Primate Reproduction. Vol. 14, 77. Epple, G. and Lorenz, R. 1967. Vorkommen, Morphologie und Funktion der Sternaldruse bei den Platyrrhini. Folia Primatologica. Vol.7, 98-126. Fleagle, J.G. 1998. Primate Adaptation and Evolution. Academic Press. Ford, S.M. and Davis, L.C. 1992. Systematics and Body Size: Implications for Feeding Adaptations in New World Monkeys. American Journal of Physical Anthropology. Vol.88, 415-468. Garber, P.A. 1992. Vertical Clinging, Small Body Size, and the Evolution of Feeding Adaptations in the Callitrichinae. American Journal of Physical Anthropology. Vol.88, 469-482. Kinzey, W.G. 1997. Leontopithecus. in New World Primates: Ecology, Evolution, and Behavior. ed. Warren G. Kinzey, Aldine de Gruyter, New York. Kleiman, D.G. 1978. Characteristics of Reproduction and Soci-sexual Interactions in Pairs of Lion Tamarins (Leontopithecus rosalia) During the Reproductive Cycle. In The Biology and Conservation of the Callitrichidae. ed D.G. Kleiman. Smithsonian Institution Press, Washington DC. Kleiman, D.G., Hoage, R.J., and Green, K.M. 1988. The Lion Tamarins, Genus Leontopithecus. in R.A. Mittermeier, A.B. Rylands, A.F. Coimbra-Filho, and G.A.B. da Fonseca (eds), Ecology and Behavior of Neotropical Primates, Vol. 2. Washington DC: World Wildlife Fund. Kuderling, I., Evans, C.S., and Abbott, D.H. 1992. Differential Excretion of Urinary Estradiol in Alpha-females and Adult Daughters of Red Bellied Tamarins (Saguinus labiatus, Callitrichidae). Abstracts of the XIVth Congreess of the International Primatological Society, Strasbourg, France, pp. 211-212. Peres, C.A. 1989. Exudate-eating by Wild Golden Lion Tamarins, Leontopithecus rosalia. Biotropica. Vol.21, 287-288. Rylands, A.B. 1989. Evolucao do Sistema de Acasalamento em Callitrichidae. In Etologia de Animais e de Homens. ed C. Ades. Pp. 87-108. Edicon, University of Sao Paulo Press, Sao Paulo. Rylands, A.B. 1993. The Ecology of the Lion Tamarins, Leontopithecus: Some Intrageneric Differences and Comparisons with Other Callitrichids. in Marmosets and Tamarins: Systematics, Behaviour, and Ecology. ed. Anthony B. Rylands, Oxford University Press. Last Updated: October 9, 2003.